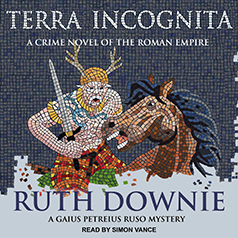 In this highly anticipated sequel to Ruth Downie's New York Times bestselling debut, beloved army doctor Gaius Petrius Ruso strikes out for the uncivilized borders of Roman Britain, where he runs into murder and the ghosts of his vexingly beautiful slave Tilla's past. It is spring in the year 118, and Hadrian has been emperor of Rome for less than a year. After his long and reluctant investigation of the murders of a handful of local prostitutes, Gaius Petreius Ruso needs to get out of town. With that in mind, he has volunteered for a posting with the army in the far reaches of Britannia—a calmer place for a tired man. But the edge of the Roman Empire is a volatile place; the independent tribes of the North dwell near its borders. These hinterlands are the homeland of Ruso's slave, Tilla, who has scores of her own to settle there: Her tribespeople, under the leadership of the mysterious Stag Man, are fomenting a rebellion against Roman control; and her former lover is implicated in the grisly murder of a soldier. Ruso, once again unwillingly pulled into the murder investigation, is appalled to find that Tilla is still spending time with the prime suspect. Worse, he is honor-bound to try to prove the man innocent—-and the army wrong—by finding another culprit. Soon both Ruso's and Tilla's lives are in jeopardy, as is the future of their burgeoning romance. Terra Incognita shines light on a remote corner of the ancient world, where Ruso's luck is running short—again.